While most home theater audio systems in consumers' homes are used for listening to both movies and music, for some, especially dedicated audiophiles, a home theater receiver doesn't cut it for serious music listening – only a dedicated two-channel audio system will do. For those that require such a setup, Yamaha has an impressive line of two-channel amplifiers. One distinctive offering in this category is A-S1100. 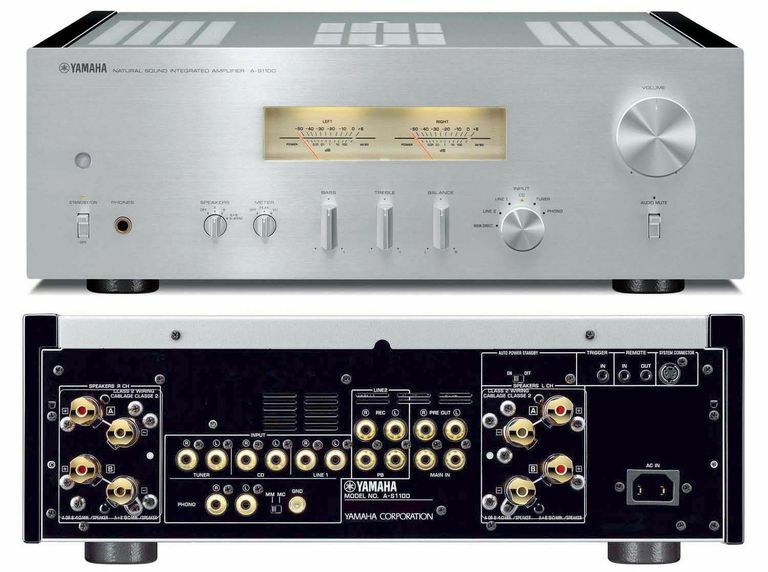 To start, the Yamaha A-S1100 is a two-channel integrated stereo amplifier that incorporates heavy duty construction and styling, including a black or silver finish option, wood side panels, and a distinctive front panel with includes large left and right channel analog level/watt meters (It would great to have that feature on a home theater receiver!). The front panel also includes large bass, treble, and balance controls, as well as a rotary input selection switch, and large classic-style volume control. Behind the front panel and its controls, the A-S1100 incorporates a large capacity power supply that can push out continuous power over long periods, as well as providing fast recovery and reaction time for audio peaks. The power output capability for the Yamaha A-S1100 is 90 wpc, using a 20Hz to 20kHz test tone range with an 8-ohm load with a .07% THD. For more details on what these stated power ratings mean with respect to real-world conditions, refer our reference article: Understanding Amplifier Power Output Specifications. The Yamaha A-S1100 is definitely no lightweight in the amplifier department. At about 50lbs it is heavier than most home theater receivers, so care is needed when lifting or moving. The Yamaha A-S1100 has all the necessary connections needed for a good two-channel audio listening setup. To start, 3 sets of analog RCA stereo inputs, as well as an audio record in/out record loop for connection of a CD recorder/Audio Cassette Deck, or other compatible recording devices, are provided. Also, Pre-amp out/Main in the loop for connection to an external amplifier or equalizer is provided, if desired. For vinyl record listening, a dedicated phono turntable input that can accommodate both Moving Magnet (MM) and Moving Coil (MC) phono cartridges (switchable via a front panel control). In terms of speaker connections, the A-S1100 provides both A and B speaker output connections which can also be configured for a bi-wiring setup using heavy-duty brass screw-on speaker terminals. You can connect either 4 or 8-ohm speakers if you are using either the A or B speaker connection options. However, if you are using A and B speakers at the same time (including for Bi-Wiring) you must use 8-ohm speakers only. Unlike a home theater receiver or amplifier that has a Zone 2 function, the same audio signal is sent to both the A and B speakers if that feature is used. For private listening, the AS-1100 also includes a front-mounted 1/4-inch headphone jack. However, one speaker-type connection option you won't find on the Yamaha A-S110 is a subwoofer output. After all, this is a classic old school two-channel stereo we are talking about – So for best listening results, use a set of good full-range floor-standing speakers, rather than bookshelf units. Control options include the provided remote as well as rear-panel IR sensor plug-in connections (labeled Remote) so that the A-S1100 can be hidden from view or control another compatible device that has an IR sensor input connection. A 12-volt trigger is also provided that can be used to turn one additional compatible component on or off. The A-S1100's remote control can operate select Yamaha Tuners and CD Players. The Yamaha A-S1100 is a high-end integrated amp that provides powerful clean sound desires for serious music listening. The A-S1100 is designed to be a match with Yamaha's High-end CD-S2100 CD player but can be used with any audio source that has analog audio outputs. The A-S1100 can also be used as part of a second or third zone audio system in conjunction with home theater receivers that feature multi-zone capability. The suggested price for the A-S1100 is $2,499.95 (Available in Silver or Black).